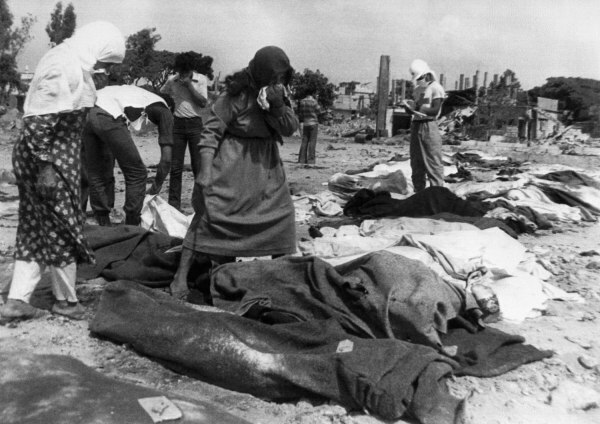 Palestinian, holding handkerchiefs to their faces, look for the bodies of relatives, victims of the Sabra-Shatila massacre in the Palestinian refugee camps in Beirut on Sept. 16-18, 1982. BEIRUT – Thirty-one years ago over the course of three days, Christian militiamen slaughtered up to 3,500 Palestinian and Lebanese civilians in a refugee camp in Lebanon. The Sabra-Shatila massacre, as it came to be known, became one of the bloodiest chapters of Lebanon’s 14-year civil war. As Palestinian refugees in Lebanon paused to remember the Sept. 16 anniversary of the massacre, the grim event offered a cautionary tale to the flood of Syrian refugees now coming across border into Lebanon. With almost 750,000 Syrians having crossed the border into this country of just 4 million, fears are running high that this new wave of people will plunge Lebanon back into war. For Abu Maher Hamza, a Palestinian who survived the Sabra-Shatila massacre, the memories are still strong. 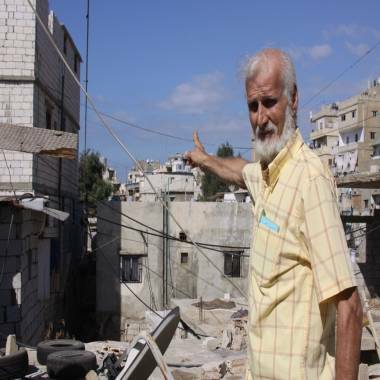 Abu Mazen Hamza, age 67, on his rooftop, points toward the street where he saw 12 dead bodies while fleeing from gunmen during the Sabra-Shatila massacre in 1982. Maher peeped out and saw two militiamen soundlessly open fire on a young woman. Terrified, he ran upstairs and told everyone to keep quiet and leave the house by an empty alleyway. His mother-in-law worried she would slow them down. “I carried her on my shoulders,” said Hamza. Once outside he saw an old neighbor, shot dead in front of his shop. On the main road, they found 12 more bodies, including women and children. The gunmen were let into the camps by Israeli military who controlled the Beirut suburb. Israeli troops surrounded the camps and lit the night sky with flares, while the massacre continued for three days. “No matter how many times I walk down those streets, I remember the people I saw,” said Hamza, now 67. Most of the victims were buried in a mass grave, a field of soil, marked by a simple gravestone. The massacre is also reminder to many Lebanese of how destabilizing a massive influx of foreigners can be. Lebanon has kept its borders open to the Syrians, but rejected U.N. offers to build formal refugee camps. The main reason is a fear that Syrians will stay on, creating pockets of resistance against the Syrian regime from within Lebanon, draining an already inadequate supplies of electricity and resources, driving up rent and driving down wages, and increasing tension between Shiite and Sunni Muslim communities. So instead, newcomers build tents with refuse on rented plots of rocky land, crowd into rented garages or derelict buildings. A delegation of Palestinian Liberation Organization members pray at the mass grave on the 31st anniversary of the Sabra- Shatila massacre. Sectarian violence has already spilled over the Syrian border and into Lebanon in the form of car bombs and clashes. Hezbollah, Lebanon’s strongest political power and militia, is sending fighters to support the regime of Syrian President Bashar Assad. For the Palestinian refugees who have been here for decades, life continue to be a struggle in a country they can never really call home. Hamza came to Lebanon as a baby when his parents were forced out of Palestine in 1947, the year of Israel was founded. Although his wife is Lebanese, he isn’t entitled to citizenship, just a travel document used by the stateless. Largely banned from working in professional fields, Palestinians are stuck in blue collar jobs where they are paid up to half or a third of their Lebanese counterparts. And although they are required to pay taxes, they aren’t entitled to social benefits, like social security and free education. Hamza, a retired barber, owns his house, but cannot own the land it is built on. He, like 95 percent of all Palestinians, has no health insurance and depends on the United Nations Relief and Works Agency for medical care and schooling. Mother walks her children home from the U.N. sponsored school they attend in the Palestinian refugee camp of Shatila, in Beirut’s southern suburbs. Hamza is among the luckier ones: A recent UNRWA study found that 73 percent of Palestinians in Lebanon are poor, 56 percent jobless and only half attend secondary school. To make matter worse, some 90,000 more Palestinian refugees have fled over the border from Syria since the civil war began, driving rents up and wages down in overcrowded Palestinian shantytowns. “UNWRA in Lebanon has stepped up its education, health, relief and other emergency services for these refugees who are part of what has been called the largest humanitarian crisis of the last decade,” said Ann Dismorr, UNRWA Director in Lebanon. Among the influx of new arrivals, Abu Mazen Hamza feels like Lebanon’s original refugees are more forgotten than ever.